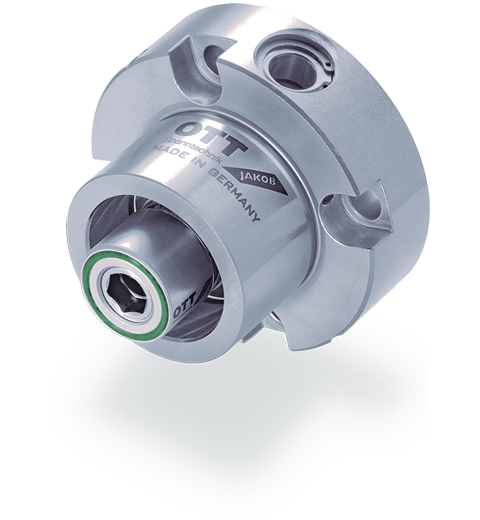 Manual Tool Clamping - OTT-JAKOB | Advanced Machine & Engineering Co.
By adding manual clamping systems to its product range, OTT-JAKOB has become a full provider of clamping technology solutions. 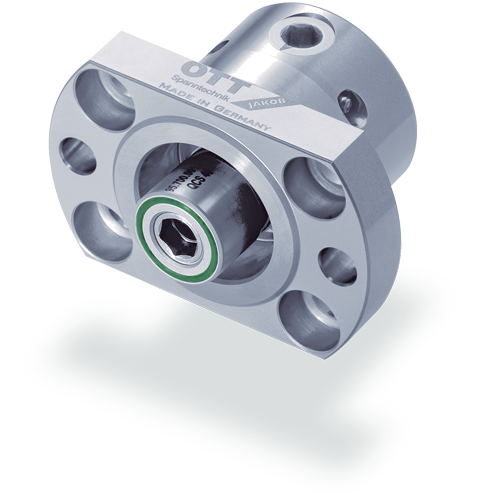 Manual clamping units from OTT-JAKOB are always the right solution when tools are to be changed with little time and effort. Thanks to their short set-up times – compared to products from other manufacturers – our manual clamping units are particularly suited to producing very small series. So as to guarantee maximum precision for even manual tool changes, HSK and PSC are two interfaces which have proven themselves for many years in automatic machine tools. OTT-JAKOB manual clamping units for PSC/Coromant CAPTOTM tools work with spring force, which makes them significantly different from other clamping solutions available on the market. 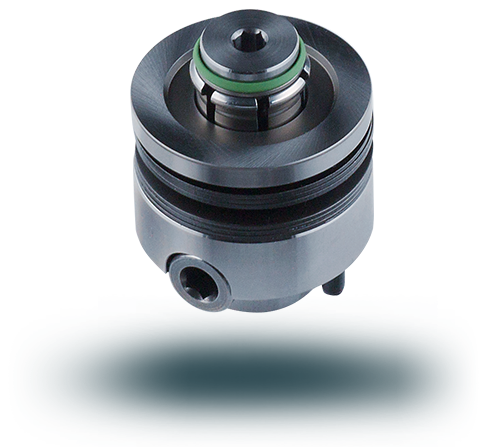 Due to this design feature, the clamping force is independent of the actuating torque. CTC and SVC from OTT-JAKOB are two ranges which can be used with coolant. 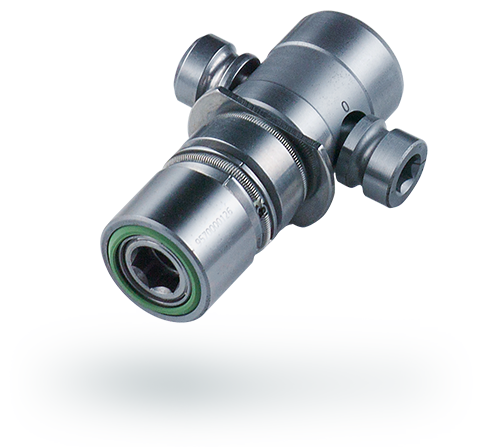 The CTC manual clamping unit was designed for rotating applications and is the only quick-clamping system available on the market which is actuated via the coolant hole. The tool can easily be mounted using a torque wrench from the front of the polygonal profile. Thanks to clamping through spring, little actuating torque is required. The SVC range is used in static machining. With its short projecting length, SVC has more space for the workpiece and a larger flight radius. The built-in seal effectively protects the clamping area from becoming flooded with coolant. Little actuating torque is required to reach high clamping forces. A conventional hexagon socket wrench is required to change tools. The hollow-shaft taper has proven itself after spending many years in use and is now an established manual tool-clamping interface as well. 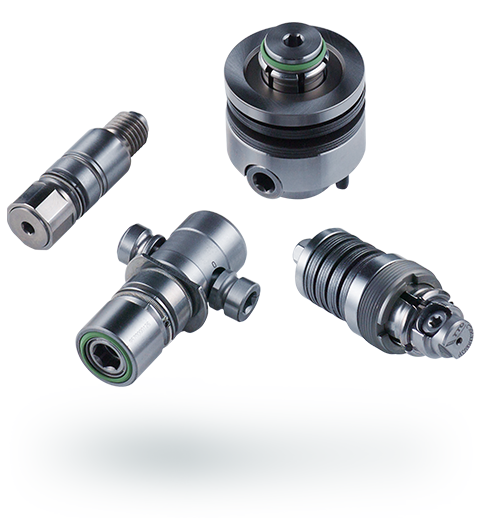 With the QCS and ACS manual clamping units as well as the QCG and QCF mounting groups, our range delivers solutions for static and rotating applications alike. HSK has already become a standard interface in rotating processes. To make it possible to use it in static operations in turning machines, OTT-JAKOB – inspired after joining the HSK-T working group – developed the QCS manual clamping unit. The quick-change clamping system (QCS), designed especially for manual quick changes with HSK holders, is compatible with all HSK standards (A, B, E, F, T). It is not necessary to change the turret. The generation of force through Archimedean spirals produces a self-locking effect. Easy to operate with a spanner, it guarantees quick and easy tool changes. QCS can be used with and without coolant. It is particularly effective if combined with an HSK-T tool and an HSK-T holder. This is due to the high positioning accuracy resulting from the limited tolerance of the HSK-T driver grooves. The QCG mounting group consists of the QCS clamping unit and a flange for common HSK sizes. The challenging HSK inside contour is already present. The QCF mounting group comprises the QCS clamping unit and a universal flange that is compatible with all conventional HSK standards. 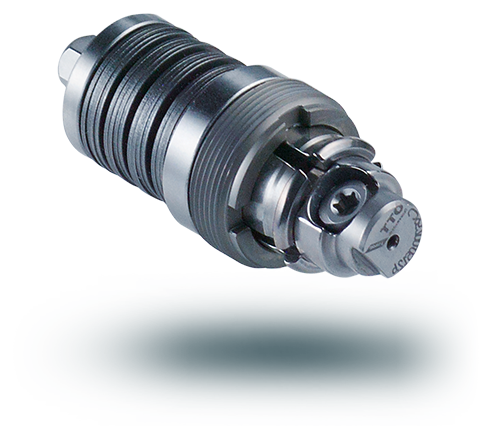 QCF is designed for use in rotating applications.